We are using grapecity Active Reports 10. while viewing the report, we are getting error like Report is not available. When the report is opened for first time, it shows the "Report Not Available" error message. And for the next time onwards it shows report data and Report Not Available error message on the same report. Below is the code used to view the report. We tried checking the IIS handlers as well, they are as expected. The error you're facing usually occurs when the handlers aren't configured correctly. Kindly open the following documentation link and refer to the section 'To add handlers without configuring IIS 7 or IIS 8 using the DefaultAppPool' under Integrated Mode topic. The topic explains how to add the handlers under the <system.webserver> section in web.config. Please change the version from ar8 to ar10 in the route path. Let me know if you're still facing the error. But still i'm getting the error "Report is not available". As i mentioned earlier, when i open the report for the first time, i'm getting "Report is not available" error message. when i closed the report and open the same report, data is coming. Why it is behaving differently?? Note: This is a high priority issue. Please help me in resolving this issue. Could you please share the images "Console" and "Network" of the browser in both cases? Please share the exact AR version that you are using. Also, if possible, could you please share the stripped down sample with us? 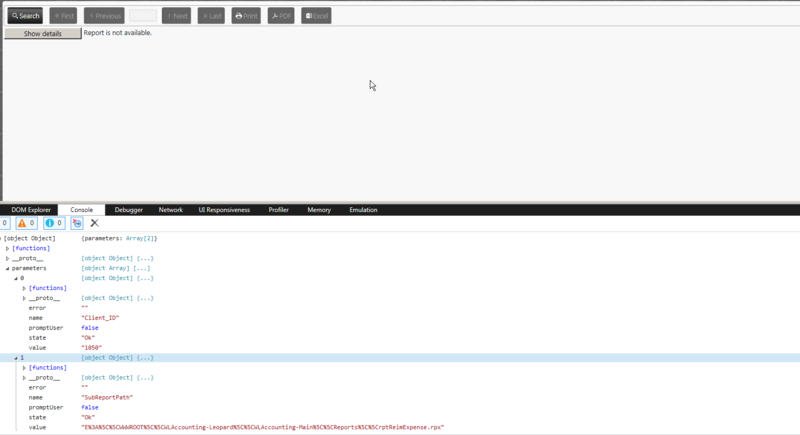 We tried removing the console.log in reportLoaded function, but issue not resolved. The Active Reports version is 10.0.5602.0. 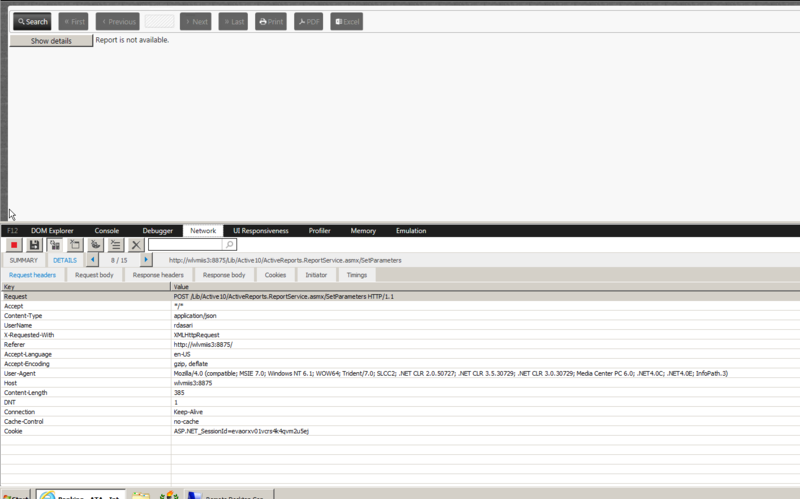 The following are the screenshots of the Network window. Could you please share the screenshot of "Request Headers" instead of "Response body" in "NetWork" tab. 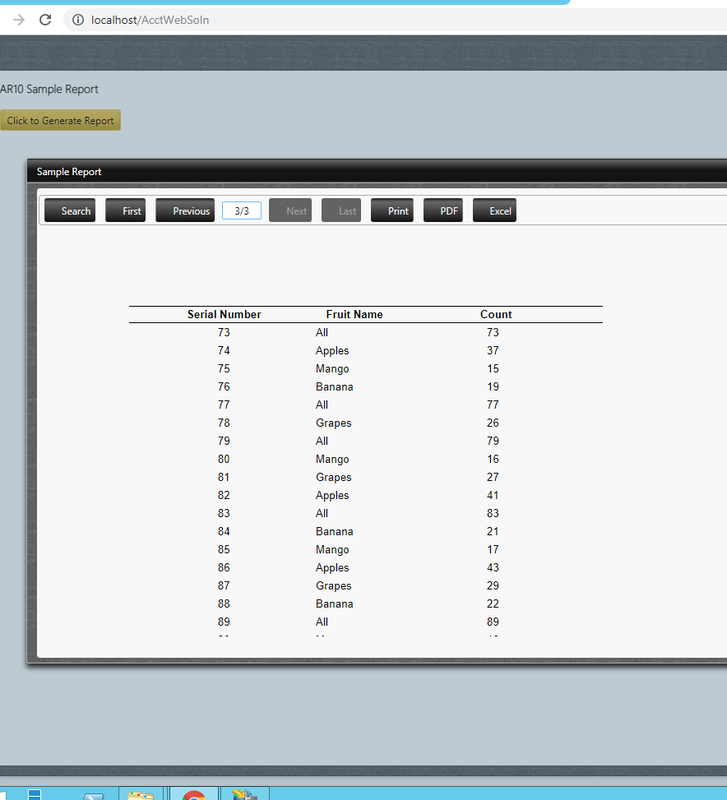 I have created the sample application for you. If issue is not reproducible with attached application then could you please modified the application so that I can replicate the issue at my end. You can delete the references of above dll's in the project as these dll's never used in the project. In my project, i'm using the above requested dll files. If you haven't installed the latest version of AR10 then you may face the license issue on rebuilding the project. Hence, please install the latest version on your machine. Also, please refer the attached zip file for the desired dll's. 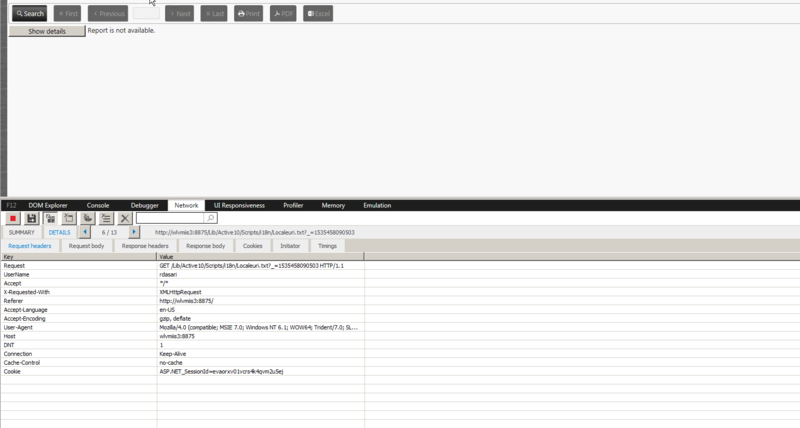 We updated the dll's to the latest version of Activer Reports 10. The issue happens only when showing the report on Web. Exporting of the Active Report to a file location using c# works fine. Following are the screenshots for the Request Headers for the Active reports. Could you please confirm that issue is also reproducible with the sample that I have provided you earlier. The Active Reports is working fine on the Development Server. But the issue happens only on the production server .This issue happens not only for my project, it happens in all the projects hosted on the production server. Active Reports on the production server worked fine till August 13th. Could you please guide us what could be the issue. Could you please tell is there any action performed by you after 13 August like server update, AR build update etc? Also, could you please try after restarting the application pool. There are no AR build updates installed on Windows 2012 R2 machine, we tried restarting the application pool as well, but there is no luck. We have two production boxes Windows 2008 R2 and Windows 2012 R2. When we host the project in Windows 2008 R2, Active reports are working fine without any issues. The issue happens with only Windows 2012 R2, we tried hosting our project in other windows 2012 R2 machines, the same Active Report issue happens there. Note: Only the Active Reports Web Viewer is throwing an error as mentioned in this thread, Generating an active Report through c# code works fine without any issues. Please let us know if we could have a call to solve this issue. As this has been one of the critical issues in our project. Could you please provide us the sample so that we can replicate the issue our end. This will be very helpful for us to resolve the problem asap. Hello Mohith, Please find the sample project in the attached link. I have deployed your application on Windows 2012 R2. and the report is previewed successfully at my end. Please refer to the attached image. 2: Clicked on the "Click to Generate Report"
Request to please confirm if I am missing something. 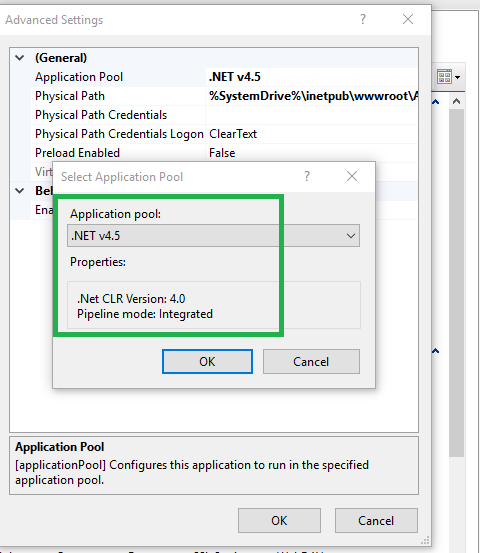 Could you please check that Pipeline mode of "Application Pool' of deployed application is "Integrated" or "Classic". If it is classic, then please try after changing to "Integrated" Mode. Please refer to the attached image. I checked the application pool settings for the project, the pipeline mode is already set as Integrated mode. We deployed the same application in the Windows 2012 R2 version, but the following issue still happens. 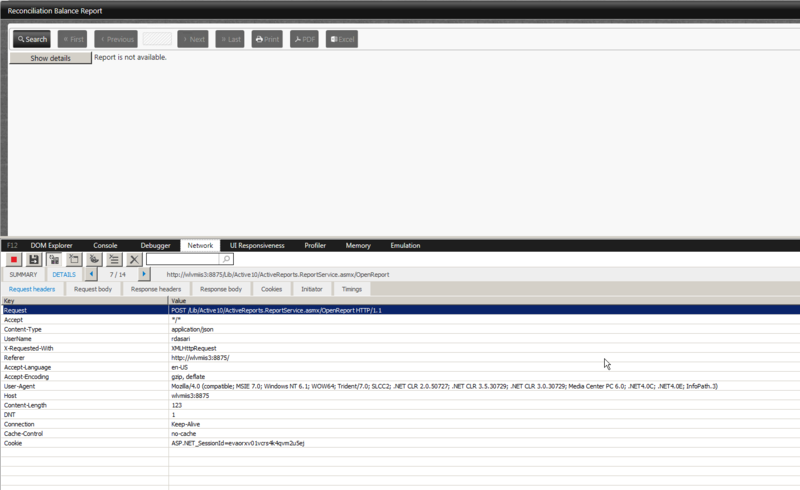 I could see that the handlers have been set up correctly in web.config. On the other hand, you've placed the ActiveReports.ReportService.asmx file under the Lib/Active10 folder whereas the Reports folder is under the root folder. Hence, the service is unable to find the report at the specified relative location. 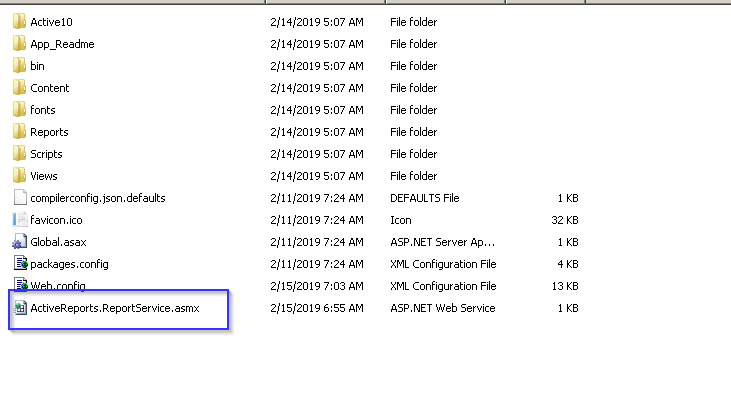 Please move the ReportService.asmx file under the root folder of the application so the Reports folder path is relative to the report service. If you're still facing the issue, kindly open the browser's Developer Tools (F12) and go the Network tab. Now when you click on the 'Click to Generate Report' button, you'll be able to see the exact request that is causing the problem. Please send a screen shot of the Network tab. We moved the ReportService.asmx page as per your suggestion. but it doesn't solve the issue. Can you please take a look at the screenshots. Perhaps I wasn't clear enough. 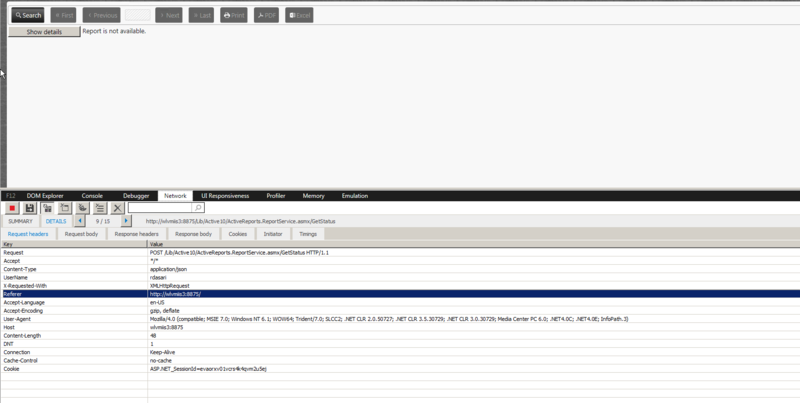 The report service needs to be in the root directory of the application i.e in the same folder as the Reports folder. Please see attached screen shot. We tried to move the Activereports.ReportService.asmx file to the root folder as mentioned above. But, it still didn't solve the issue. It shows the same error message 'Report Not Available'. I have moved this issue to our support system (http://supportone.componentone.com/home/casedetail/367453). Kindly login with your existing credentials (used to login to the forums) or create a new account with the same email address on our support portal. We'll proceed with this issue through the support portal here on.